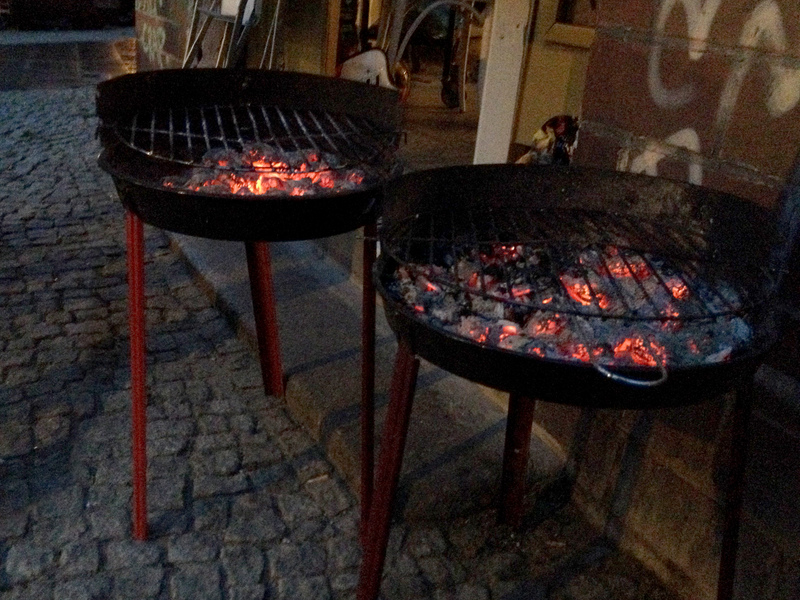 While the concept of having a Barbecue is well known in Berlin, the more common / popular way of preparing food outdoors is probably Grilling. During the summer months you can basically buy grilling devices and grilling utensils at many Supermarkets. But also some late shops and even gas stations usually have at least the basics on display: from bags full of charcoal to barbecue grates and ‘throw-away pans’ made of aluminium – and of course beer. For decades the local authorities were quite liberal about people grilling in parks, in courtyards and on sidewalks. As soon as people thought is is nice enough to sit and eat outdoors, people would be sitting and eating outdoors. This has changed a bit over the past decades – but still the laws and rules concerning the grilling culture are probably still quite liberal, compared to other cities / other countries. The central park ‘Tiergarten’ used to be a hot spot for grilling and barbecue. Rumors went that on some weekends some families from Wedding, Kreuzberg and Neukölln would bring half a cow. While I have never seen half a cow in Tiergarten, I did see crowds and crowds of people, all equipped with whatever sort of grilling device. On some weekends the park was literally full of smoke. And later on piles of trash would covered the green, burnt spots of grass everywhere, left-overs and litter filled trash containers. Where can I go Grilling / have Barbecue BBQ in Berlin? Recently the authorities became a bit stricter and release a list of rules and laws to regulate the ongoing grilling action in Berlin. Since 2012 neither Barbecue nor Grilling is actually allowed in Tiergarten – which is a shame. And also in other ‘hot spots’ grilling got regulated. But of course this doesn’t mean that it would be generally illegal to grill in public or private grounds. You may of course be grilling or doing a barbecue on private grounds at any time – as long as you don’t ‘bother’ anybody – for whatever that actually means. If you prefer to have your grilling and/or barbecue in a more private atmosphere you may consider renting a ‘garden’. There are for example these two party-gardens available in Potsdam, at Volkspark Potsdam.